Penny Pincher Journal- Save Money Every Day! If you can get a lower interest rate, you should refinance your mortgage- right? Not necessarily. 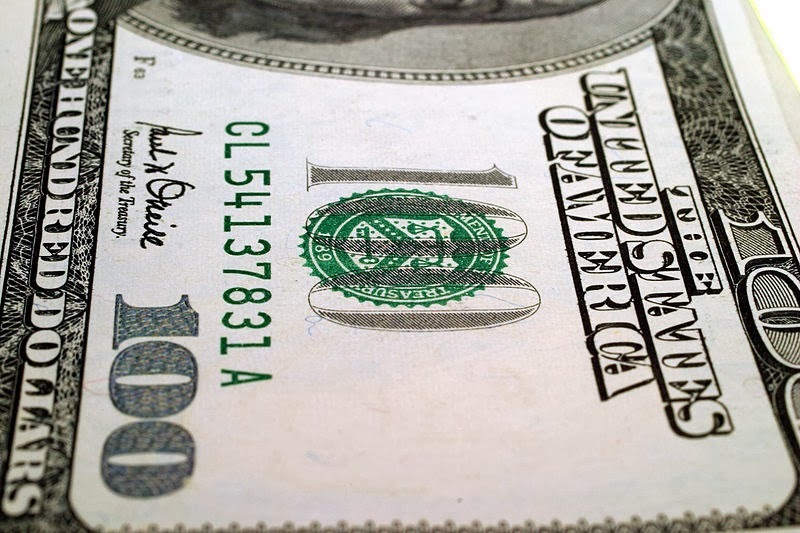 Refinancing a mortgage costs money. The bank that issues the loan to refinance your mortgage charges origination fees that can amount to thousands of dollars. If you don't end up staying in your home long enough, you can easily end up losing money on a mortgage refinance. Another unexpected cost of refinancing is that it can extend your payments further into the future, increasing the amount of time you are paying interest. For example, if you have been paying on a 30 year mortgage for 3 years and then get a new 30 year mortgage in a mortgage refinance, you'll be paying interest for 3 more years than if you kept your original loan. Even if the interest rate is lower, this can still add up to more total interest payments over time. When Can I Save Money If I Refinance My Mortgage? Whether or not you will save money by refinancing comes down to the details: how much lower is the interest rate? How much are the loan origination fees? How long will you stay in your house? A mortgage refinance calculator can help you decide if you should refinance your mortgage. Using a mortgage refinance calculator will let you determine how much money you can save over the life of the mortgage. The calculator above adds your refinance loan fees to the refinance mortgage amount- which is how most people cover the refinance loan fees. You can see the affect of the lower interest rates on a refi in the form of lower monthly payments. These lower payments save you money every month- until you reach the point where your original mortgage would have been paid off. The calculator above calculates the total cost of your original mortgage and your refinance loan, so you can check the total cost of each and see if you would save money overall by refinancing. You can also learn how long it will take for your savings on interest every month to cover the refinance loan fees. For example, if it would take 24 months for your monthly savings to cover your refinance loan fees, you would need to stay in your house at least 24 months for a refinance to make sense. If you sell your house before you reach the point where your interest savings have covered your refinance loan fees, then you would loose money by refinancing. The main reason people refinance a mortgage is to get a low interest rate and save money on interest payments. If you can pay less and get the same house, why not do it? If you can get a lower monthly payment, you can use the money to pay down high interest debt, such as credit cards. Or, you can keep the same payment and pay off your mortgage years earlier with a refinance. These are good options to have. Another reason people refinance a mortgage is to get out of a variable interest rate mortgage, or balloon mortgage. Some mortgage loans have interest rates that can change over time. You can sometimes get a lower interest rate in the short term, but there is a risk that interest rates will rise and you will end up paying more. Most people who plan to stay in their home for a long time prefer the security of a fixed rate mortgage. This means that your principal and interest payment will never go up. I recently investigated refinancing my mortgage, but it turned out that it would pretty much be a break-even proposition. It wasn't worth the effort to complete the mortgage application and pay fees to refinance. My mortgage interest rate was already very low, so refinancing would not improve the rate by much at all. The interest rate you have on your current mortgage is largely dependent on when you applied for your mortgage. Mortgage interest rates move up and down all the time, and some years the prevailing interest rate is higher or lower than others. If you got your original mortgage when interest rates happened to be low, there may be no benefit to refinancing. However, if you ended up with a higher rate, you could save a lot of money by refinancing. The only way to know if you can save money by refinancing your mortgage is to check current rates and see how much you could save. How much could you save if you refinance your mortgage? A mortgage refinance, also known as a "refi", means that you get a new mortgage for your home at a lower interest rate. This mortgage refinance calculator shows you how much you will save based on the interest rate of the mortgage refinance loan. 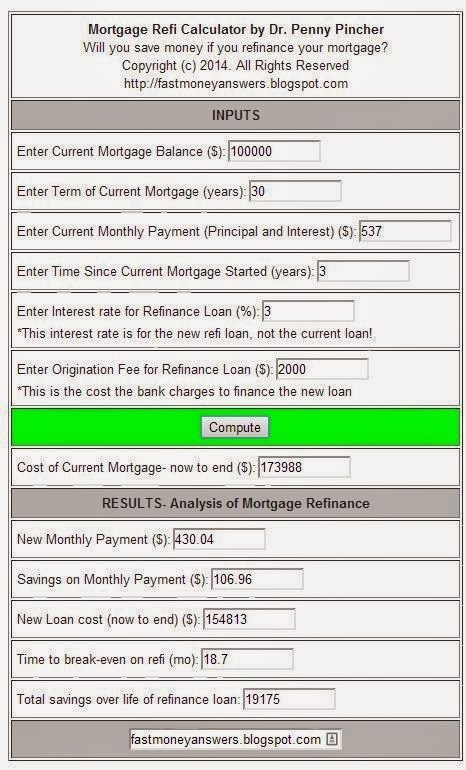 Enter the information for your current mortgage loan information and the interest rate for the mortgage refinance loan in the calculator below and click "Compute" to see how much you can save by refinancing. Example entries have been filled in for a 100,000 mortgage balance with 30 year term, monthly payment of $537 that started 3 years ago. The example mortgage refi has an interest rate of 3% and an origination fee of $2000. Simply change the example information to the information for your mortgage. Will you save money if you refinance your mortgage? *This interest rate is for the new refi loan, not the current loan! The current mortgage balance is the amount that you currently owe on your mortgage. The current mortgage term is the total duration of your current mortgage, typically 30 years. You can use this mortgage calculator to calculate the principal + interest payment on your current mortgage using the original mortgage balance and current mortgage interest rate. If you want to see how Principal, Interest, Taxes, and Insurance contribute to your monthly mortgage payment, check out this mortgage calculator. The time since your current mortgage started is needed to determine how much you can save by refinancing. You can input decimal values, such as 3.25 years. The next entry is the interest rate for your new refinance loan. You can look up current refinance rates in newspapers or on the internet. It costs money to get a mortgage loan-this is known as the origination fee. The Mortgage Refinance Calculator determines how long it will take to break-even on a refinance using the origination fee and your monthly savings. In this case, the break-even time means how long it takes your monthly payment savings to cover the refinance origination fee. The refinance loan origination fee is added to the refi loan amount in the calculator. Check the bottom line of the calculator: Total savings over life of refinance loan. If a negative value is shown for savings, you will loose money over the life of the loan by refinancing! One way this can happen is if you nearly have your current mortgage paid off. Let's say you are paying $500 per month and have 5 years left to pay off your mortgage. If you refinance you could get a new 30 year mortgage and save hundreds of dollars per month on payments- but you will be making payments for 30 more years rather than 5. So even if the refi interest rate is lower, continuing to make payments longer can still add up to more money paid on interest. You can pay more by refinancing in a scenario where you have almost paid off your original loan. Note that the calculator assumes you will have the same term for the refinance that you had for the original mortgage. For example, if the original mortgage was a 30 year loan, the calculator uses a 30 year term for the refinance loan. As you can see when trying out refinance scenarios, it takes some time to break-even on the refinance to cover the cost of the refinance loan origination fee. Since your interest rate on the refinance loan is lower, you'll save money every month. It will take months of interest rate savings to cover the refinance fee- perhaps even a few years, depending on interest rates. Getting a mortgage refinance makes sense only if you will be staying in your current house for awhile. You can use the calculator to see how long you would need to stay in your current house for a mortgage refinance to make sense. Another good use of the calculator is to see how much money you would actually save by refinancing before going through the effort- and fees- to get a new mortgage loan. If you are interested in how mortgage payments are calculated, the mortgage payment formulas used in the calculators are from the Mortgage Professor. If you know your tax or insurance cost, you can enter these costs into the calculator. If you don't know the tax and insurance costs, the Mortgage Payment Calculator also estimates your property taxes and insurance costs and calculates your monthly payment including principal, interest, taxes, and insurance. Click "Compute" to see your monthly mortgage payment for principal and interest. The calculator will automatically calculate typical property tax and insurance cost based on the home's value and enter these in the calculator. The calculator will also calculate your total monthly mortgage payment including principal, interest, taxes, and insurance. Optional: If you know your actual property tax or insurance costs, you can replace the automatically calculated estimates and enter your own values. Click "Update" to update the monthly mortgage cost using your own figures for taxes and insurance. This monthly payment formula is used in the Mortgage Payment Calculator. These Products Will Save You Money!